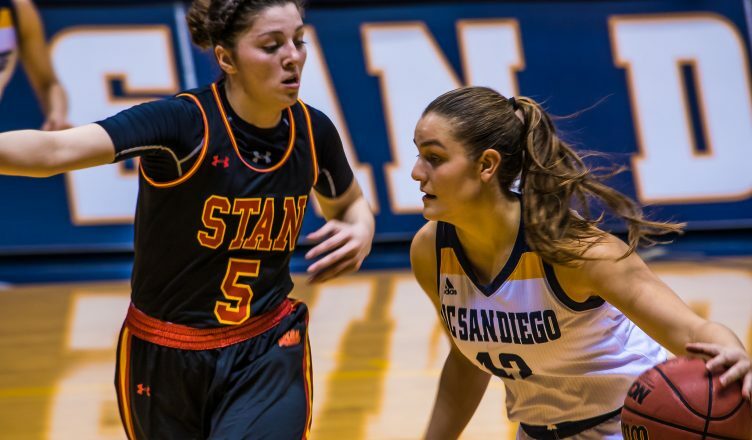 In a shooting-fest on Saturday evening, the UC San Diego women’s basketball team put up a season high of 90 points against Sonoma State to earn its second consecutive win, 90–78. From start to finish, it was an entertaining game to watch with the visitors putting up a fight until the end. Sonoma State is a below-.500 team, but playing against UCSD must have gotten the best out of the team because the Seawolves were shooting lights out and definitely provided some danger to the Tritons. UCSD improved to 13–1 in conference play and an overall record of 17–3. The high-scoring affair opened the door for plenty of breakthrough performances, and it all started with sophomore guard Sydney Sharp in the first half. Sharp shot the lights out of the building with her three-point shooting, finishing with a career-high 14 points, shooting 5–7 from the field including 4–6 from the three-point line. Sonoma State knocked down plenty of three-pointers throughout to stay in the game, finishing 10–15 from behind the arc, shooting an incredible 66.7 percent. From beyond the arc, the Tritons shot 9–16 to counteract their opponents. Outside shooting played a role in this game, however points in the paint was the difference maker in the matchup. Two Triton bigs, redshirt sophomore forward Mikayla Williams and senior forward Dalayna Sampton were too big and too strong for the Seawolves to handle. Williams finished with 17 points and seven rebounds, while Sampton capped the night off with a double-double, 23 points, and 10 rebounds. The discrepancy in points in the paint made the difference, as the Tritons finished with a healthy advantage in that department, 48–22. The only way for the Seawolves to balance out the Tritons’ points in the paint was to shoot the three-ball and for most of the game that is what kept them in the game. But at the end, the interior game of UCSD simply was too much. Junior guard Kayla Sato picked up where the Tritons left off in the first half. The third year transfer had a dominant game, scoring 14 of her 16 points in the second half. Notably as well, senior guard Taylor Tanita nearly finished with a double-double, finishing with eight points and 10 assists. The Tritons will head up north for a two-game road trip where they will face off against Sonoma State one more time followed by San Francisco State. On Friday, Feb. 2, the rematch against the Seawolves is scheduled for tip-off at 5:30 p.m.